We would like to share an original solution used in project at the zoo in Skopje, Macedonia, through the cooperation with our distributor Ergo Kom. 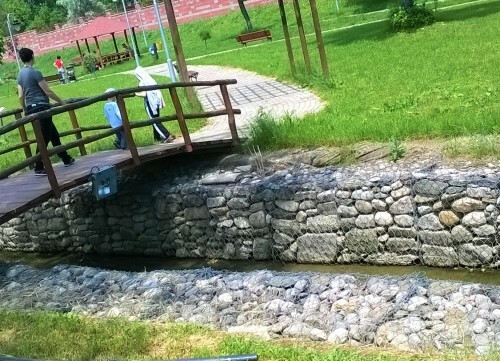 Some improvement works were necessary, between the animal cages and the water course channel flowing near the Zoo. The channel required restoration as the existing river had a lot of materials in suspension, causing it to be brown and cloudy. This indicated excessive hydraulic erosion was taking place. This was considered to be not so attractive to visitors and a solution was needed. A variety of hydraulic protection solutions were considered by the client – The Major of Skopje City – to be used in the restoration of the old channel. Then a question raised: What kind of material could maintain and clean the water channel better than gabions? The benchmark performance of gabions as hydraulic protection was recognised by the client. Therefore, as the most appropriate and practical of the solutions proposed, gabions were selected. However a product with the suitable level of quality and durability was required to deliver the performance needed. The channel and the animal cages area were successfully restored by the installation of the hydraulic protection works using Maccaferri gabions, and they continue to provide protection up to today. The environmental and visual impact of our products at the Zoo were extremely friendly with nature. The water that flows by the channel has no more a turbid color, which disturbed the visitors and everyone else before the rehabilitation. When installing gabions and Reno mattresses within hydraulic works, it is important that they are installed with a geotextile to serve as a filter and to limit the wash-out of fine silts and soils from beneath and behind the protection structures. The MacTex used in this application was placed beneath the rock filled gabions and mattresses. It is noted that there should be similar concerns for our Zoo in Tirana, which would urgently need some renovation works, starting from the cages as well as the water pond which is located in the Zoo. Maccaferri aims at being perceived as a leading contractor in the country and is willing to be an authoritative source of knowledge for the current and next generation of engineers, with one major objective: preserving Nature. Maccaferri Balkans is here to help you with advanced and sustainable Engineering-Environmental Solutions, and a deep knowledge of hydraulic works applications. Do not hesitate and contact us.